This month I became a part of The Nature Book Club! 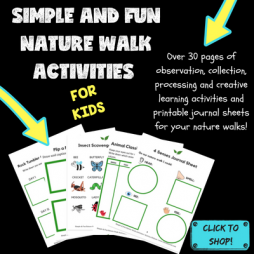 I am so excited to share our monthly nature book and activity with you! Make sure you scroll down to the bottom to see other bird books and activities, as well as how to link up with us! Most kids I know are fascinated with birds. I cannot tell you how many times my daughter and son have “waited quietly”, trying to see a bird up close in the wild. 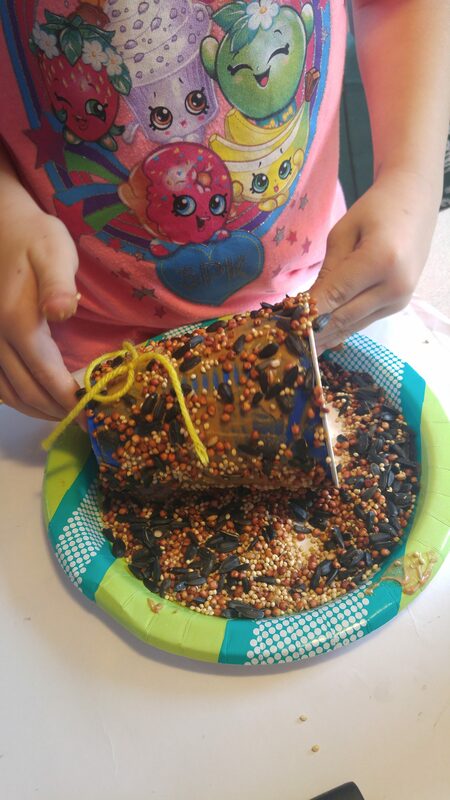 To fuel their love for birds, I ordered another super fun book about birds and we made an easy bird feeder to attract more birds to our neck of the woods. They have been checking on them daily to see how much our bird friends are eating! We read Fine-Feathered Friends: All About Birds. This book is from the “Cat and the Hat’s Learning Library”, so while it is not actually written by Dr. Seuss, it does feature our favorite character, The Cat in the Hat. The book is packed with facts about birds and presents them in the most fun way— through rhyming of course! 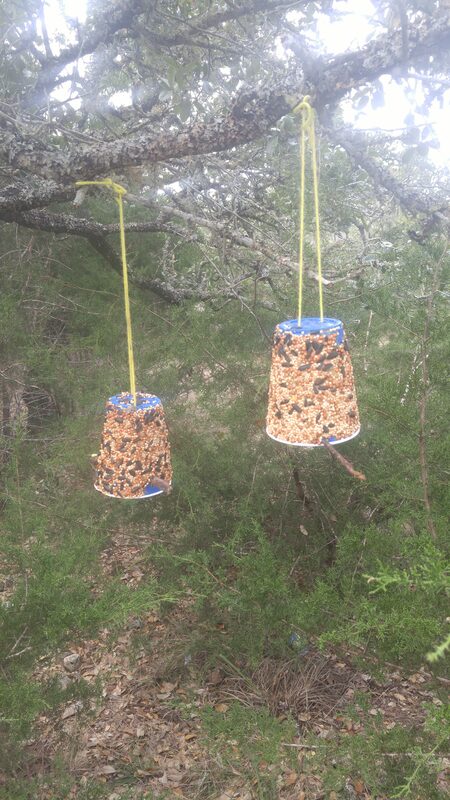 After we read our book, we set out to make a bird feeder for our bird friends that we had just read about! For more awesome nature activities, check out my newly released ebook below! First, pour about a cup of bird seed on a plate. Next, punch two holes, on opposite sides at the opening of the cup. I didn’t do this before the peanut butter, but it sure would have made it easier! 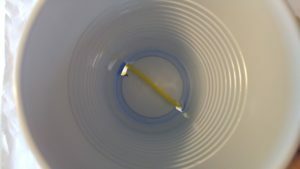 Slice two small holes at the bottom of your cup for string. 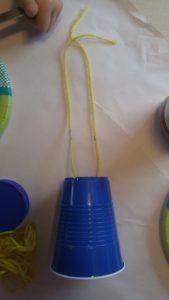 Tie the string through the slits and tie at the top to make the hanger. Once the holes are punched, the kids get to “butter the cup”. 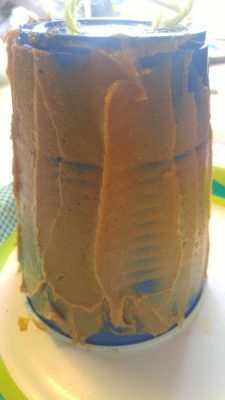 Slather on the peanut butter so the bird seed will stick. 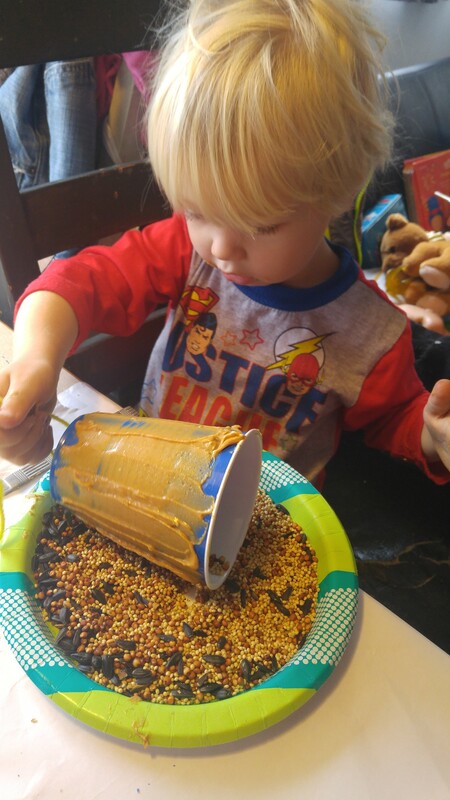 After the peanut butter is on, roll the cup in the plate of bird seed. 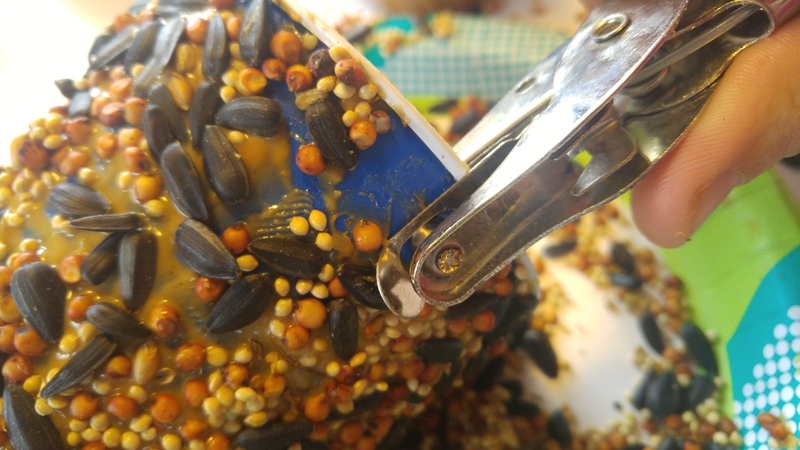 If needed to, sprinkling the bird seed over the void spaces also works. 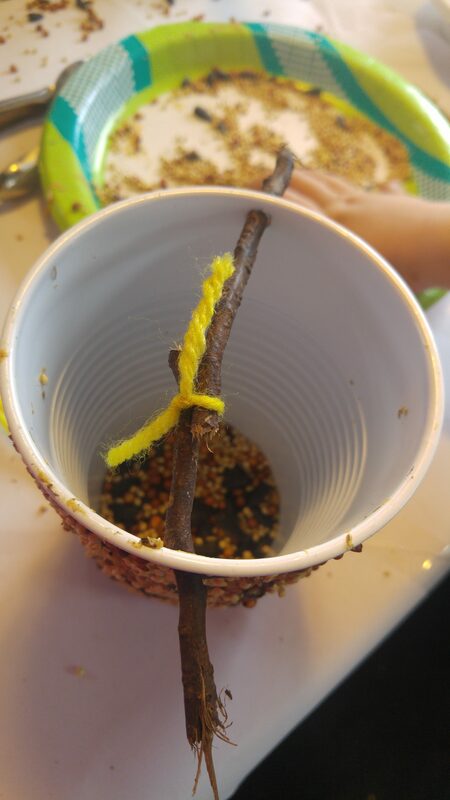 Once the bird seed is stuck on, poke the twig through the holes to create a landing spot for the birds (if your child chooses twigs that are too short, just tie them together with more string!). Hang it in your favorite tree and keep an eye out for visitors! If you need more ideas on how to get your kids connected with nature, check out 6 Ways to Engage Your Child in Nature Based Play. Scroll down for more information on The Nature Book Club and to see other bird lovin’ books and activities! Welcome to The Nature Book Club Monthly Link Up No 1. The Nature Book Club is brought to you by these 15 nature-loving bloggers which are your co-hosts! Are you following them? If you don’t want to miss anything, be sure to follow each one. Click on the link above. It’s free until February 4, 2018.
wow, that’s such a cool idea. Why didn’t I think of that? 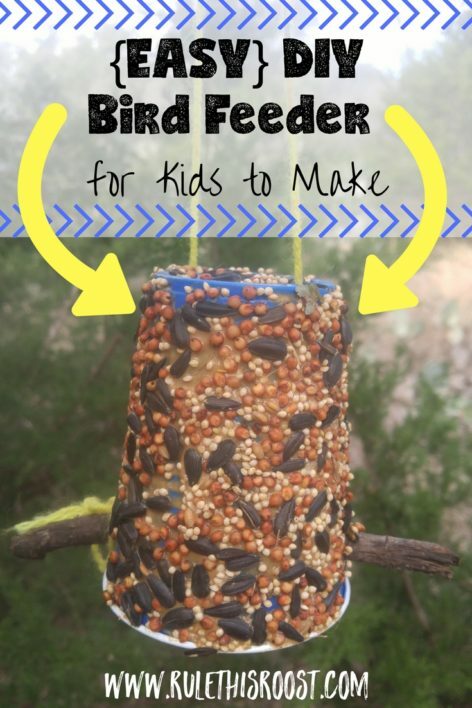 The PB is a great idea, sure the birds love that and looks like a really fun project for the kids. 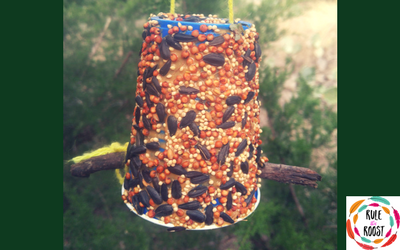 Really good tutorial on how to create an easy birdfeeder with your kids. Love it! Yes! Easy is key! I can’t wait to see what you come up with!